In this seventh-grade humanities lesson, students review and practice three cooking methods that they have used in previous kitchen lessons. Students work together to make decisions as to how they will utilize different methods to cook different ingredients. This is the fourth in the five-lesson series leading up to Iron Chef, the culminating challenge of the seventh-grade kitchen experience. Draw upon their knowledge of multiple cooking techniques to prepare fresh vegetables without following a recipe. Work collaboratively and inclusively to make group decisions. Cook without relying on the support or guidance of an adult. Sauté, roast, and steam vegetables following simple technique guidelines instead of detailed recipes. Decide how to cook each of their vegetables while practicing positive group behaviors and habits. Prepare their meal independently of their cooking teacher. 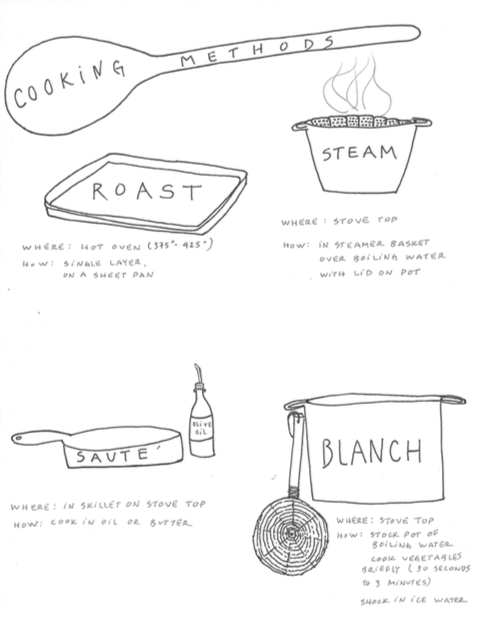 Copy the Sauté, Roast, Steam methods sheet to hand out. Copy the Ranch Dressing recipe to hand out. Today’s lesson is built around giving you practice for Iron Chef. During Iron Chef, you are going to be cooking without recipes and without adult support. You are also going to be making group decisions about what to prepare and who is going to work on each task. Today you will practice those skills in our Sauté, Roast, Steam lesson. You are going to prepare some of the cauliflower using each of these three cooking methods so that you can compare how each method impacts flavor and texture. You will decide how to prepare each of the other vegetables as a group. Can anyone explain what it means to “sauté” something? To sauté means to cook something in a pan with a little oil over medium-high heat, typically with some onion or garlic and salt, pepper, or other spices or seasonings. What dishes use sautéing that you cook at home? That we have cooked here? Based on your experience eating sautéed dishes, how would you describe how sautéing impacts flavor? What does it mean to “roast” something? Roasting is a way of cooking food in a dry, hot (400F+) oven. Generally ingredients are covered with a little oil, salt, and other seasonings before going into the oven. What vegetables have we roasted here? How would you describe how roasting impacts flavor? Texture? Steaming or boiling is a quick cooking method that highlights the existing flavor of vegetable without changing it much. It’s especially good for delicately flavored or textured vegetables. What vegetables have you had steamed or boiled before? Emphasize that boiling or steaming should be a quick process. Remind the students how tasteless the vegetables were after boiling for 20 minutes to make stock in a previous class. We are also going to make homemade ranch dressing that you can eat with your vegetables if you choose. Maximize use of the food. Minimize waste. Show how to use a peeler most efficiently. Even cuts ensure even cooking. Small-group check-in: How are you doing today? Explain that in a few minutes the students will be taking the lead and making a group decision of how to prepare the meal. To prepare them for that process, you are going to share some teamwork and collaboration skills. Group members listen to each other. Group members are respectful of one another. It is easy to think about how not to follow those ideals and what negative, destructive behaviors look like. It’s obvious that we don’t want to be exclusive by pushing people outside the group, shutting down specific people when they try to contribute, interrupting, or fighting. However, an absence of destructive behavior and interactions is not the same as having lots of positive behaviors and interactions. Instead of just cutting out bad behaviors, we want to build and practice positive interactions and habits. What is a thing you can do in a group setting to make the group more inclusive? Say someone is sitting removed from the table while everyone else is huddled in closely? Allow students to answer these questions if they can. If not, offer answers such as inviting that person to join the group or asking that person or people if there is something blocking them from participating. What can you do if you notice that you or another group member is talking most of the time and that another person hasn’t spoke at all? Ask for their opinion on something. Structure a pause to allow them time to jump in. How can you be a better listener? What practices have you learned or heard of for being a better listener? Give eye contact to the speaker. Nod along or use other nonverbal clues to show that you are following. Paraphrase what the speaker said to demonstrate understanding. How can we show our respect for one another? Give affirmations and compliments to one another to recognize contributions. Express gratitude to others and the group. It is key to do this sincerely to create as strong of a group as we can. Have you ever experienced how a bad apology hurts worse than no apology at all? The same thing can happen with feigned inclusion and respect. If you can’t do it sincerely, then it might be better to not do anything. Think about this and practice this today! This is not just for kitchen. This is for life. Eat. A good topic for conversation during this lesson is group dynamics and reviewing their group decision-making process. If there’s time, reflect on discussion from the small table groups. Encourage students to continue reflecting on their group decision-making process. Iron Chef prep: We developed this lesson as the final seventh-grade lesson before Iron Chef, the culminating challenge of the seventh grade year in the kitchen. In Iron Chef, students plan, prepare, and serve a meal using surprise ingredients, no recipes, and no adult help. We found that this lesson was a great practice run for Iron Chef because it clearly lays out three cooking methods that students report feeling more confident improvising with after the lesson, and also provides them with the opportunity to practice making group decisions and cooking without recipes. Referencing previous cooking lessons: We have found that one way to encourage independence and confidence with the cooking methods for this lesson is to prompt students to recall previous dishes they made in the kitchen and connect each dish with the corresponding cooking method. Once students have the memory of how they made something, they feel much more equipped to repeat the process with little to no guidance. Scaffolding the experience: Our goal with this lesson is for groups to work independently from adult help, but different groups require different kinds of support to make this lesson successful. The role of the teacher here is to carefully observe each individual group and provide support where needed, encouraging independence and team collaboration as much as possible. Time management: This is an excellent lesson to help students communicate with one another to coordinate the timing of all their dishes. We introduce this as a central part of the lesson and tell students that this serves as excellent practice for Iron Chef. Steamer basket: Many of our students were unfamiliar with using steamer baskets, so we started introducing it as part of the Chef Meeting. Vegetable prep and cooking time: This lesson is a great time to remind students that the size and shape of each vegetable will affect the cooking time and outcome. Encourage them to consider this when choosing how to cut their vegetables. Tasting and seasoning: Encourage students to taste and season as they go to get a sense for how each cooking method impacts flavor and texture. We often tell students that when roasting, you generally season before cooking; when sautéing, you generally season while cooking; and when steaming, you generally season after cooking. Reflecting on team dynamics: After the cooking period in this lesson, we always facilitate group reflection and discussion at the table about how the team worked together and made decisions. Encourage students to reflect on what went well and what didn’t go as well as it could. What could they do differently as a group to improve on their teamwork for Iron Chef? Asparagus: Show students how to cut the dry, tough bottoms off the asparagus. Make sure they know the tops of the spears are edible—we were surprised how many of our students threw both the tops and bottoms in the compost at first. Ranch: This recipe ended up being a big hit with our students despite initial skepticism on the part of many. No right or wrong answers: Deciding how to cook the vegetables can sometimes feel a little overwhelming. Assure students that there is no right or wrong way to cook the vegetables. Pride in independence: Students really feel a sense of pride when they complete a cooking class largely without teacher assistance. Growth through failure: Conversely, when groups don’t succeed they often jump to critical self-reflection and learn much more quickly than if told by a teacher. This happened frequently with clean-up and having lots of dishes left over. Providing space for some failure can be an incredibly effective teaching technique.